Home | Blog | Can You Explain “Grades” of Products? Restoring your home or business after damage from harsh weather or a natural disaster can be a challenging and confusing process. You want to choose the right products and materials to restore your property, but understanding the pricing of your project estimate and insurance appraisal can be complicated. Products and materials for commercial or residential restoration projects are available in various grades that reflect different price points and product quality. Those various grades offer different benefits for your project needs and restoration budget. By understanding the grades of products and building materials, you can make the right choices for your home or business restoration project. What Are “Grades” of Products? Rather than being defined by specific standards or regulations, these product grades are general categorizations that represent tiers of quality. Each product grade may reflect differences in the manufacturing process, materials used in the product’s construction and the ability to customize the product. The grade of a product is also indicative of its relative price. Building materials or products categorized as “custom” or “ultra-custom” will be high-end products that have been customized to the buyer’s exact specifications, including size, color, material, configuration and more. These products will typically be the most expensive option for any given product. Custom and ultra-custom grade products usually need to be specially ordered and are not readily available in hardware stores. Products that are “builder” or “quality” grade products will be more affordable options that typically come in standard sizes and configurations designed to fit most homes. Builder grade products are also referred to as “contractor grade” or “commercial grade.” These products often represent the most affordable option for a product because they are mass-produced and pre-built. Builder or quality grade products may not offer the same customization options as custom and ultra-custom grade products, but they can still provide excellent performance and good quality at a much lower cost. For some materials or products, the difference between each grade may not be easily recognizable. Two products may appear the same but reflect different grades and price points. This difference in grade may be due to the internal construction of the product or material and may contribute to its longevity but may not impact the appearance of the product. Many builder grade products offer excellent performance and durability but have more simplified features than higher grade models. What Does “Like Kind and Quality” Mean in Restoration? If your home or business suffers damage from fire, wind, water, storm or another natural disaster, you will need to file a claim to have the losses covered by your insurance carrier. While each property insurance policy is different, many carriers will offer coverage for repairs that are necessary to return the property to its original condition before the loss occurred. This coverage may use the term “like kind and quality” to define the condition to which the property will be restored with the covered repairs. When a home or business is restored to “like kind and quality” condition, the property owner can expect the building to be returned to the same or very similar condition as it was prior to the damage. Restoration to “like kind and quality” will use the same grade, composition and quality of materials that were present at the time the loss occurred. For example, if the original flooring in a home cost one dollar per square foot, the insurance policy will cover flooring of similar appearance and price to be used in the restoration. However, a “like kind and quality” clause does not necessarily limit a home or business owner’s options for building materials and products used in restoration after a loss. If the property owner in the previous example desired to use new flooring priced at five dollars per square foot instead of one dollar per square foot, they would be able to do so by submitting a change order. 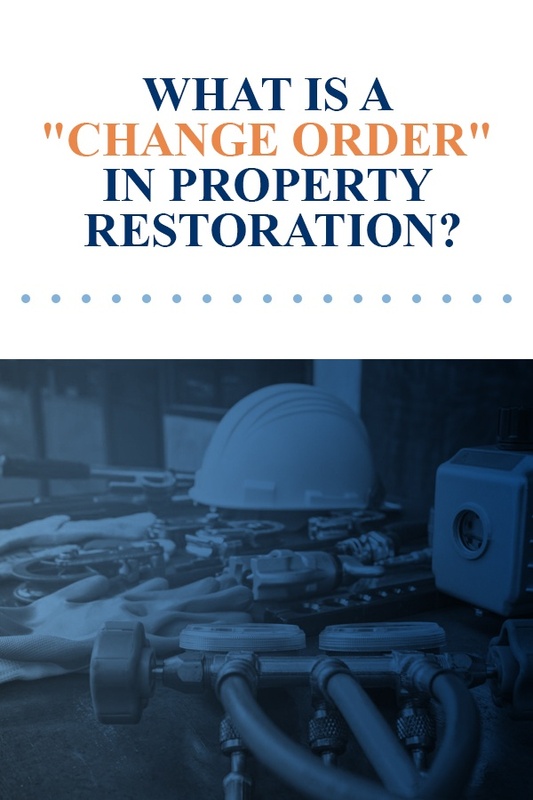 What Is a “Change Order” in Property Restoration? Sometimes a home or business owner that has suffered a loss desires to improve the quality of their property during the renovation, rather than simply returning it to its condition before the loss. For example, if a homeowner installed new flooring five years ago but it has since experienced wear and tear, they may be appraised for a lower price of flooring to account for depreciation. To use more expensive or higher grade flooring in their property restoration, they would need to file a change order to account for the cost difference. A change order allows a building owner to upgrade to materials or products that are more expensive than what their insurance carrier covers. Depending on your specific policy, the insurance company will pay for the appraised value, and the home or business owner will pay the difference. In other instances, a restoration specialist may discover additional repairs that were not noted in the original appraisal of a property following the loss. These repairs will not automatically be covered by the insurance company under a “like kind and quality” clause but may be covered by submitting a supplement. What Is a “Supplement” in Restoration? A supplement can be submitted by the renovation contractor when additional damage is discovered during the renovation, but it must be approved before those repairs are made. Once the insurance carrier approves the supplement, the renovation can be finished, and the costs detailed in the supplement will be covered by the property insurance carrier. While submitting a supplement and having it approved can add extra days or weeks to a renovation project, it is sometimes necessary to be able to restore the property to its previous condition. What Does “Commercial Grade” or “Contractor Grade” Mean for My Restoration Project? When creating an estimate for your restoration project, a contractor may quote contractor grade products and building materials to return your home to its previous condition. Builder grade materials are often the most affordable option and are readily available so your restoration project can begin promptly. Because contractors are able to purchase these pre-built products in large quantities, this can lower the cost even further for the home or business owner. Affordable: Builder grade products allow you to stay within your budget when restoring your home or business. Because these products and building materials are mass-produced, they are often the most affordable option on the market. Builder grade products are perfect for cabinets, flooring, doors and other basic aspects of your home or business. Best price for their quality: Because contractors can buy builder grade products in bulk, this allows the consumer to enjoy a better price for the quality of product they are receiving. Readily available: Contractor grade products are always available in standard sizes, colors and configurations so your restoration project can begin immediately. Custom products, on the other hand, must be specially ordered and can put your restoration project on hold for several weeks. Easy to upgrade: Builder grade products are a great option for home or business owners who want to upgrade their property in the future but do not have the budget to do so right now. Because of their affordability, contractor grade products can be used until funds are available to upgrade to premium or customized products. When you choose Tuckey Restoration, Inc. for your home or business restoration project, our professional contractors will work with you to determine the right grade of products and building materials for every application. We can help you determine when you would like to use affordable contractor grade products and when you may prefer to upgrade to custom grade materials. By weighing your budget, priorities and timeline, Tuckey Restoration specialists can select the perfect building materials and products for any restoration need. Why Is Grading Important to Me as a Customer? Understanding the grades of products can help you make informed decisions during a home or business restoration or renovation. You can prioritize premium products where they are most important to you and cut costs elsewhere with affordable builder grade materials. For example, builder grade doors often have a hollow construction, making them lightweight and less expensive than solid wood doors. These doors can have the same high-quality appearance of more expensive grades of doors and are perfect for interior doors. However, because hollow-core doors do not provide as much insulation as solid wood doors, you may choose to upgrade to a higher grade product for your exterior doors. Similarly, many home and business owners choose to invest in higher grade windows that are more efficient at trapping heat inside the building. These are smart ways to balance cost and quality in your home or business restoration project to make the most of your budget. Durability: Consider how long you plan to live in your home when choosing products during a home restoration. Builder grade products tend to have a shorter lifespan than higher grade products. However, their availability and affordability may make them the perfect option for getting back on your feet after your home or business is damaged by fire or flood. Homeowners can later upgrade to more durable products as they have the budget available. For homeowners who plan to sell their home within the next few years, they can cut expenses with contractor grade products. Availability: Because they are mass-produced in standard sizes, builder grade materials and products are readily available. Choosing contractor grade products allows your restoration project to get underway faster. Budget: When considering the costs of individual products, take into account the installation cost and how soon the product may need to be replaced. For products with intensive installations, such as roofing or flooring, the cost of labor may make the long-term cost of the product much higher if you choose a less durable product that needs to be replaced sooner. Products like faucets, cabinets or doors are much easier to replace, making them more affordable to switch or upgrade down the road. When choosing products and building materials for your home or business renovation, the most important factor is working with a contractor you trust. A reliable home restoration specialist will provide clear explanations between the grades of individual products and help you make informed choices for your project. They will offer honest cost estimates and make sure you are satisfied with your finished restoration or renovation. Choose Comprehensive Restoration Services From Tuckey Restoration, Inc.
At Tuckey Restoration, Inc., we are proud to be a trusted local leader for residential and commercial restoration, offering professional restoration services to the South Central Pennsylvania region since 1968. Our comprehensive services mean we are equipped to tackle any restoration project, whether you need new plumbing, a restored HVAC system, mold remediation after flooding or general damage repair. Tuckey Restoration can restore your business or home quickly and completely after damage from fire, water, wind or storm. Our restoration specialists are happy to help you choose the right product and material grades for your needs to ensure your finished restoration meets and exceeds your expectations. If you are seeking builder grade restoration in Carlisle, Harrisburg or York PA, contact Tuckey Restoration today.